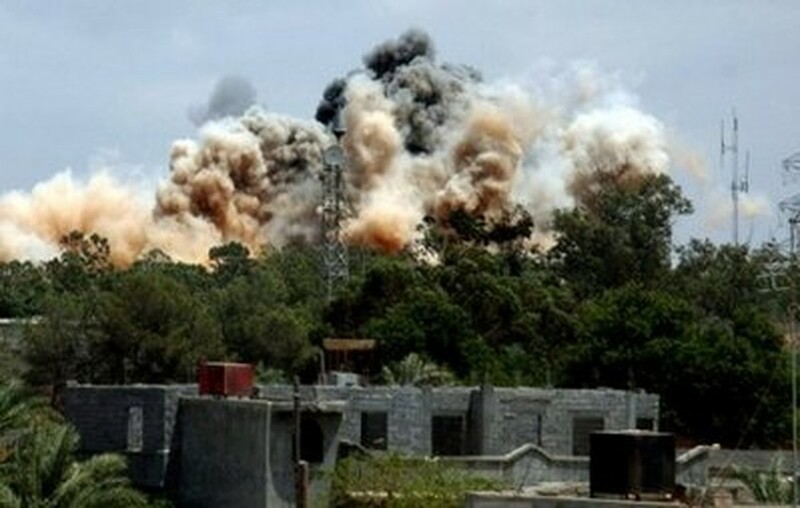 TRIPOLI, May 28, 2011 (AFP) - A powerful explosion on Saturday rattled central Tripoli where Libyan strongman Moamer Kadhafi has his residence, an AFP reporter said. A plume of white smoke could be seen rising into the sky soon after the blast sounded at 10:00 am (0800 GMT) in the Bab Al-Aziziya neighbourhood where Kadhafi's compound is located. AFP file - Smoke billows behind the trees following an air raid on the area of Tajura, east of Tripoli on May 24. The raid struck an army barracks, not far from the residence, which NATO-led forces have targeted for four successive days. The alliance had said its earlier air strikes were on military vehicle depots. The series of blasts have caused the collapse of sections of imposing walls around the barracks, which is full of warehouses, although the Libyan authorities say they have been emptied.